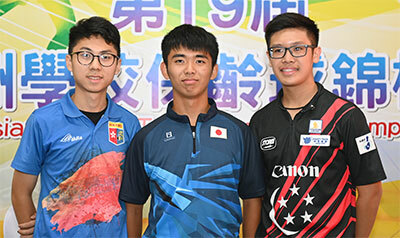 2nd October, Taichung: Japanese debutant, Genki Hayashi and Arianne Tay of Singapore topped the Boy's and Girl's Singles opening squad of the 19th Asian School Tenpin Bowling Championships underway at Da Chung Bowling Centre. 2017 Asian School Masters silver medallist, Alex Yu of Hong Kong A set a cracking pace with 237 in his opening game to lead Hokuto Fujinaga of Japan by 3 pins followed by two Australians, Callum Borck and Daniel Perrella in third and fourth. Yu tried to extend his lead with another strong game of 225 but the Japanese closed stayed with a strong 226. Singapore's B team of Owen WOng added 231 to his 200 opening game to take over third spot. The 17-year-old Hong Kong national youth member was on a roll reeling in 243, 204 and 258 but had to be content with second position. Genki Hayashi knocked down two stunning games of 299 and 286 to take over the lead from the fourth game and opening up a gap of 68 pins. Hayashi ended with 225 and topped the squad with 1460. Yu settled for second position with 1351, 109 pins away while Wong kept third position with 1307. The two Aussies, Borck and Perrella completed the top 5 with 1281 and 1273 respectively. Meanwhile in the girl's division, Singapore youths made their mark when 14-year-old Arianne Tay of surprised her elder sister, Arielle Tay of Team A by topping the squad with 1281. Filipina Danielle Pazo of Philippines A set the opening pace but quickly faded our of contention. Arianne took over the lead after a sizzling 262 in her second game with Australia B's Ashlyn Mohr in second. Arianne conitnued her blistering pace with 214 and 226 in her next two games to extend her lead. 15-year-old Arielle added several big games to move into second spot but soon had to give up the spot when Mohr fought on galantly to keep close with the Tay siblings. Although Arianne managed only 172 in her fifth game, she ended with 207 to comfortably take the squad. 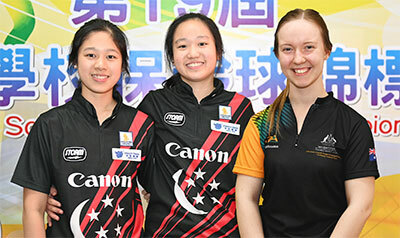 Arielle gave Singapore a one-two finish with 1212 while a second Australian and 2017 Asian School Singles silver medallist, Emily Johnston stormed home to clinch third spot with 1170. Apart from the leader's average of 213.50, the chances of the second and third placed in this squad would remain on a much lower average. Squad B for the boys and girls will commence after lane maintenance and the combined scores from both the squads will determine the winners of the opening event. Competition will shift to the Doubles, again over two squads tomorrow, October 3.